(1) This chapter shall be administered by the department. (2) The department may adopt and enforce all rules which it finds necessary or suitable to carry out this chapter. The department shall make a copy of such rules available to any person upon request. The department may require from any employing unit which employs one or more individuals to perform work in this state any reports on employment, wages, hours and related matters which it deems necessary to carry out this chapter. 108.14 Cross-reference Cross-reference: See also ch. DWD 123, Wis. adm. code. (2e) The department may provide a secure means of electronic interchange between itself and employing units, claimants, and other persons that, upon request to and with prior approval by the department, may be used for departmental transmission or receipt of any document specified by the department that is related to the administration of this chapter in lieu of any other means of submission or receipt specified in this chapter. If a due date is established by statute for the receipt of any document that is submitted electronically to the department under this subsection, then that submission is timely only if the document is submitted by midnight of the statutory due date. (2m) In the discharge of their duties under this chapter an appeal tribunal, commissioner or other authorized representative of the department or commission may administer oaths to persons appearing before them, take depositions, certify to official acts, and by subpoenas, served in the manner in which circuit court subpoenas are served, compel attendance of witnesses and the production of books, papers, documents and records necessary or convenient to be used by them in connection with any investigation, hearing or other proceeding under this chapter. A party’s attorney of record may issue a subpoena to compel the attendance of a witness or the production of evidence. A subpoena issued by an attorney must be in substantially the same form as provided in s. 805.07 (4) and must be served in the manner provided in s. 805.07 (5). The attorney shall, at the time of issuance, send a copy of the subpoena to the appeal tribunal or other representative of the department responsible for conducting the proceeding. However, in any investigation, hearing or other proceeding involving the administration of oaths or the use of subpoenas under this subsection due notice shall be given to any interested party involved, who shall be given an opportunity to appear and be heard at any such proceeding and to examine witnesses and otherwise participate therein. Witness fees and travel expenses involved in proceedings under this chapter may be allowed by the appeal tribunal or representative of the department at rates specified by department rules, and shall be paid from the administrative account. (3) The department may appoint, employ and pay as many persons as it deems necessary to administer and to carry out the purposes of this chapter, and may make all other expenditures of any kind and take any other action consistent herewith which it deems necessary or suitable to this end. (3m) In any court action to enforce this chapter the department, the commission, and the state may be represented by any licensed attorney who is an employee of the department or the commission and is designated by either of them for this purpose or at the request of either of them by the department of justice. If the governor designates special counsel to defend, in behalf of the state, the validity of this chapter or of any provision of Title IX of the social security act, the expenses and compensation of the special counsel and of any experts employed by the department in connection with that proceeding may be charged to the administrative account. If the compensation is being determined on a contingent fee basis, the contract is subject to s. 20.9305. (4) The department may create as many employment districts and district appeal boards and may establish and maintain as many free public employment offices as it deems necessary to carry out the provisions of this chapter. The department shall have power to finance either partly or completely such public employment offices as it deems necessary under this chapter, from the funds appropriated to the department for its expenses under this chapter, whether or not the political subdivision in which such office is located agrees to pay or does pay any part of the expenses of such office. (a) The council on unemployment insurance shall advise the department in carrying out the purposes of this chapter. The council shall submit its recommendations with respect to amendments of this chapter to each regular session of the legislature, and shall report its views on any pending bill relating to this chapter to the proper legislative committee. (ag) The vote of 7 of the voting members of the council on unemployment insurance is required for the council to act on a matter before it. (ar) The department shall present to the council on unemployment insurance every proposal initiated by the department for changes in this chapter and shall seek the council’s concurrence with the proposal. The department shall give careful consideration to every proposal submitted by the council for legislative or administrative action and shall review each legislative proposal for possible incorporation into departmental recommendations. (b) Under its authority in s. 15.04 (1) (c), the department may appoint employment councils for industries and local districts. Each such council shall be subject to the membership requirements of s. 15.227 (3). (6) It shall be one of the purposes of this chapter to promote the regularization of employment in enterprises, localities, industries and the state. The department, with the advice and aid of any employment councils appointed under sub. (5) (b) and the council on unemployment insurance, shall take all appropriate steps within its means to reduce and prevent unemployment. The department shall also conduct continuing research relating to the current and anticipated condition of the fund to ensure the continued availability of benefits to unemployed individuals under this chapter. To these ends the department may employ experts, and may carry on and publish the results of any investigations and research which it deems relevant, whether or not directly related to the other purposes and specific provisions of this chapter. At least once a year the department shall compile and publish a summary report stating the experience of employer accounts, without naming any employer, and covering such other material as it deems significant in connection with the operations and purposes of this chapter. (a) The records made or maintained by the department or commission in connection with the administration of this chapter are confidential and shall be open to public inspection or disclosure only to the extent that the department or commission permits in the interest of the unemployment insurance program. No person may permit inspection or disclosure of any record provided to it by the department or commission unless the department or commission authorizes the inspection or disclosure. (b) The department may provide records made or maintained by the department in connection with the administration of this chapter to any government unit, corresponding unit in the government of another state or any unit of the federal government. No such unit may permit inspection or disclosure of any record provided to it by the department unless the department authorizes the inspection or disclosure. (bm) Upon request of the department of revenue, the department may provide information, including social security numbers, concerning claimants to the department of revenue for the purpose of administering state taxes, identifying fraudulent tax returns, providing information for tax-related prosecutions, or locating persons or the assets of persons who have failed to file tax returns, who have underreported their taxable income, or who are delinquent debtors. The department of revenue shall adhere to the limitation on inspection and disclosure of the information under par. (b). (c) The department may provide for the printing and distribution of such number of copies of any forms, records, decisions, regulations, rules, pamphlets or reports, related to the operation of this chapter, as it deems advisable for the effective operation thereof. 108.14 Cross-reference Cross-reference: See also ch. DWD 149, Wis. adm. code. (a) The department may enter into administrative arrangements with any agency similarly charged with the administration of any other unemployment insurance law, for the purpose of assisting the department and such agencies in paying benefits under the several laws to employees while outside their territorial jurisdictions. Such arrangements may provide that the respective agencies shall, for and on behalf of each other, act as agents in effecting registration for work, notices of unemployment, and any other certifications or statements relating to an employee’s claim for benefits, in making investigations, taking depositions, holding hearings, or otherwise securing information relating to coverage or contribution liability or benefit eligibility and payments; and in such other matters as the department may consider suitable in effecting the purpose of these administrative arrangements. (b) An employee’s eligibility to receive benefits based on wages earned in employment in this state may be established through arrangements authorized in this subsection, and the employee shall then be paid the benefits due him or her under this chapter. (c) Any person who willfully makes a false statement or misrepresentation regarding a benefit claim, to the employment security agency of another state acting under any administrative arrangement authorized in this subsection, shall be punished in the manner provided in s. 108.24. (a) The department may enter into reciprocal arrangements, with any agency administering another unemployment insurance law, whereby all the services performed by an individual for a single employing unit, which services are customarily performed in more than one state or jurisdiction, shall be deemed to be employment covered by the law of a specified state or jurisdiction in which a part of such services are performed, or in which such individual has residence, or in which such employing unit maintains a place of business; provided there is in effect, as to such services, an election by such employing unit, approved by the agency administering the specified law, pursuant to which all the services performed by such individual for such employing unit are deemed to be employment covered by such law. (b) If the federal unemployment tax act is so amended as to make subject thereto remuneration paid for any maritime employment excluded under s. 108.02 (15) (k) 17., such exclusion under this chapter shall cease if the department enters into a reciprocal arrangement with respect to such employment pursuant to this paragraph, as of the effective date of such arrangement. The department may enter into reciprocal arrangements with the appropriate agencies of other states with respect to such maritime services, whereby all such services by an individual for a single employer, wherever performed, shall be deemed performed wholly within this state or within any such other state. Any such services thus deemed performed in Wisconsin shall also be deemed “employment” covered by this chapter, and the election requirement of s. 108.02 (15) (c) 2. shall not apply. (a) The department shall enter into a reciprocal arrangement which is approved by the U.S. secretary of labor pursuant to section 3304 (a) (9) (B) of the internal revenue code, to provide more equitable benefit coverage for individuals whose recent work has been covered by the unemployment insurance laws of 2 or more jurisdictions. (b) Arrangements under par. (a) may provide, as to any individual whose employment has been covered by this chapter and by the unemployment insurance law of one or more other participating jurisdictions, for transfer by the department to another agency of relevant records or information, and the acceptance and use of the records and information, in combination with similar data from other jurisdictions, by the other agency, as a basis for computing and paying benefits under the law administered by the other agency. Reciprocally, arrangements under par. (a) may provide for similar acceptance, combination and use by the department of data received from other jurisdictions to compute and pay benefits under this chapter. (c) Arrangements under par. (a) shall provide for mutual acceptance by the participating agencies of data supplied under par. (b), including reasonable estimates of relevant data not otherwise available in the transferring agency. (d) Arrangements under par. (a) shall specify an equitable basis for reimbursing the unemployment fund of each participating jurisdiction for any benefits paid therefrom on the basis of covered employment in, and data supplied by the agency of, another participating jurisdiction, out of the unemployment fund of the other jurisdiction. (e) The department shall charge this state’s share of any benefits paid under this subsection to the account of each employer by which the employee claiming benefits was employed in the applicable base period, in proportion to the total amount of wages he or she earned from each employer in the base period, except that if s. 108.04 (1) (f), (5), (7) (a), (c), (cg), (e), (L), (q), (s), or (t), (7m) or (8) (a) or (b), 108.07 (3), (3r), or (5) (b), or 108.133 (3) (f) would have applied to employment by such an employer who is subject to the contribution requirements of ss. 108.17 and 108.18, the department shall charge the share of benefits based on employment with that employer to the fund’s balancing account, or, if s. 108.04 (1) (f) or (5) or 108.07 (3) would have applied to an employer that is not subject to the contribution requirements of ss. 108.17 and 108.18, the department shall charge the share of benefits based on that employment in accordance with s. 108.07 (5) (a) and (b). The department shall also charge the fund’s balancing account with any other state’s share of such benefits pending reimbursement by that state. (f) To facilitate the application of arrangements under par. (a) to this chapter, the department may, from data received by it under such arrangements, make reasonable estimates of quarterly wages and may compute and pay benefits accordingly. (b) Overpayments of unemployment insurance benefits as determined under applicable federal law, with respect to benefits or allowances for unemployment provided under a federal program administered by this state under an agreement with the U.S. secretary of labor, may be recouped from unemployment insurance benefits otherwise payable under that program, or under the unemployment insurance law of this state or of another state or any such federal unemployment benefit or allowance program administered by the other state under an agreement with the U.S. secretary of labor if the other state has in effect a reciprocal agreement with the U.S. secretary of labor as authorized by 42 USC 503 (g) (2), if the United States agrees, as provided in the reciprocal agreement with this state entered into under 42 USC 503 (g) (2), that overpayments of unemployment insurance benefits as determined under this chapter, and overpayments as determined under the unemployment insurance law of another state which has in effect a reciprocal agreement with the U.S. secretary of labor as authorized by 42 USC 503 (g) (2), may be recouped from benefits or allowances for unemployment otherwise payable under a federal program administered by this state or the other state under an agreement with the U.S. secretary of labor. (8t) If the agency administering another unemployment insurance law has overpaid benefits to an individual located in Wisconsin, and certifies to the department the facts involved and that the individual is liable, under such law, to repay such benefits, and requests the department to recover such overpayment, and agrees to reimburse the department for any court costs incurred by it in such recovery efforts, the department may in its own name, but acting as agent for such other agency, collect such overpayment by civil action, and shall pay the net amount recovered to such other agency. (9) The department may make its records relating to the administration of this chapter available to the Railroad Retirement Board, and may furnish the Railroad Retirement Board, at the expense of said board, such copies thereof as said board deems necessary for its purposes. The department may afford reasonable cooperation with every agency of the United States charged with the administration of any unemployment insurance law. The department may make arrangements or agreements with the Railroad Retirement Board, or any other agency of the United States charged with the administration of an unemployment insurance law, with respect to the establishment, maintenance and use of free employment service facilities, the taking and certifying of claims, the making of investigations, and the supplying of other information or services related to unemployment insurance, but the department may not make or renew any such arrangement or agreement unless it finds that its resulting administrative costs are approximately covered or offset by the facilities, services and payments to be made available thereunder by such federal agency. Any moneys received by the department under this subsection shall be paid into the federal administrative financing account under s. 108.161. (9m) The department may afford reasonable cooperation with any government agency charged with war-effort or post-war planning responsibilities or with the administration of any system of unemployment allowances or unemployment assistance or of any other program designed to prevent or relieve unemployment. All moneys payable to or received by this state for any program of allowances pursuant to an agreement with any government or nonprofit agency, whereby moneys are made available to the state solely for that purpose, shall be paid to the state and shall promptly be deposited by the department to the credit of a separate account therefor, with such custodians as the state may from time to time select, who shall hold, release and transfer the cash in any such account in a manner approved by the department of administration. Payments from any such account shall be made upon vouchers or drafts authorized by the department, in such manner as the department of administration may from time to time approve or prescribe. The treasurer of the unemployment reserve fund shall serve as treasurer of any account under this subsection. The bond of the treasurer, as required under ss. 19.01 (2) and 108.16 (4), shall likewise be conditioned upon the faithful performance of the duties under this subsection by the treasurer and the treasurer’s subordinates, in such additional amount as may be fixed by the department. The treasurer shall report annually to the department of administration regarding receipts and disbursements under this subsection. (10) The department shall comply with requirements of the U.S. secretary of labor to determine the degree of accuracy and timeliness in the administration of this chapter with respect to benefit payments, benefit determinations and revenue collections. (11) The department may require any employing unit which employs one or more individuals to perform work in this state to make such arrangements as will reasonably assure the department that the employing unit will keep such records, make such reports, and pay such contributions as are required under this chapter. Any employing unit which the department has notified, through notice served on it or sent by registered mail to its last-known address or served by publishing a notice under s. 180.1510 (4) (b), that it is required to make such arrangements and which fails to do so within 20 days after such notification may, through proceedings instituted by the department in the circuit court for Dane County, be restrained from doing business in this state until it has made such arrangements. (a) Consistently with the provisions of pars. (8) and (9) of section 303 (a) of Title III of the federal social security act, all moneys received in the federal administrative financing account from any federal agency under said Title III shall be expended solely for the purposes and in the amounts found necessary by said agency for the proper and efficient administration of this chapter. (b) Consistently with said provisions of said Title III, any such moneys, received prior to July 1, 1941, and remaining unencumbered on said date or received on or after said date, which, because of any action or contingency, have been lost or have been expended for purposes other than, or in amounts in excess of, those found necessary by said agency for the proper administration of this chapter, shall be replaced within a reasonable time. This paragraph is the declared policy of this state, as enunciated by the 1941 legislature, and shall be implemented as further provided in this subsection. (c) If it is believed that any amount of money thus received has been thus lost or improperly expended, the department on its own motion or on notice from said agency shall promptly investigate and determine the matter and shall, depending on the nature of its determination, take such steps as it may deem necessary to protect the interests of the state. (d) If it is finally determined that moneys thus received have been thus lost or improperly expended, then the department shall either make the necessary replacement from those moneys in the administrative account specified in s. 108.20 (2m) or shall submit, at the next budget hearings conducted by the governor and at the budget hearings conducted by the next legislature convened in regular session, a request that the necessary replacement be made by an appropriation from the general fund. (e) This subsection shall not be construed to relieve this state of any obligation existing prior to its enactment with respect to moneys received prior to July 1, 1941, pursuant to said Title III. (13) The department may, with the advice of the council on unemployment insurance, by general rule modify or suspend any provision of this chapter if and to the extent necessary to permit continued certification of this chapter for grants to this state under Title III of the federal social security act and for maximum credit allowances to employers under the federal unemployment tax act. (14) The department shall fully cooperate with the agencies of other states, and shall make every proper effort within its means, to oppose and prevent any further action which would in its judgment tend to effect complete or substantial federalization of state unemployment insurance funds or state employment security programs. (15) The department may make, and may cooperate with other appropriate agencies in making, studies as to the practicality and probable cost of possible new state-administered social security programs, and the relative desirability of state, rather than national, action in any such field. (16) The department shall have duplicated or printed, and shall distribute without charge, such employment security reports, studies and other materials, including the text of this chapter and instructional or explanatory pamphlets for employers or workers, as it deems necessary for public information or for the proper administration of this chapter; but the department may collect a reasonable charge, which shall be credited to the administrative account, for any such item the cost of which is not fully covered by federal administrative grants. (17) To help provide suitable quarters for the administration of this chapter at the lowest practicable long-run cost, the department may, with the governor’s approval and subject to all relevant statutory requirements, use part of the moneys available for such administration under s. 20.445 (1) (n) to buy suitable real property, or to help construct suitable quarters on any state-owned land, or for the long-term rental or rental-purchase of suitable land and quarters. In each such case full and proper use shall be made of any federal grants available for the administration of this chapter. (18) No later than the end of the month following each quarter in which the department expends moneys derived from assessments levied under s. 108.19 (1e), the department shall submit a report to the council on unemployment insurance describing the use of the moneys expended and the status at the end of the quarter of any project for which moneys were expended. (19) No later than March 15 annually, the department shall prepare and furnish to the council on unemployment insurance a report summarizing the department’s activities related to detection and prosecution of unemployment insurance fraud in the preceding year. The department shall include in the report information about audits conducted by the department under sub. (20), including the number and results of audits performed, in the previous year. (20) The department shall conduct random audits on claimants for benefits under this chapter to assess compliance with the work search requirements under s. 108.04 (2) (a) 3. (21) The department shall maintain a portal on the Internet that allows employers to log in and file with the department complaints related to the administration of this chapter. (22) The commission shall maintain a searchable, electronic database of significant decisions made by the commission on matters under this chapter for the use of attorneys employed by the department and the commission and other individuals employed by the department and the commission whose duties necessitate use of the database. (a) The department shall create and periodically update a handbook for the purpose of informing employers that are or may be subject to this chapter about the provisions and requirements of this chapter. 1. Information about the function and purpose of unemployment insurance under this chapter. 2. A description of the rights and responsibilities of employers under this chapter, including the rights and responsibilities associated with hearings to determine whether claimants are eligible for benefits under this chapter. 3. A description of the circumstances under which workers are generally eligible and ineligible for benefits under this chapter. 4. Disclaimers explaining that the contents of the handbook may not be relied upon as legally enforceable and that adherence to the content does not guarantee a particular result for a decision under this chapter. 5. A line to allow an individual employed by an employer to sign to acknowledge that the individual is aware of the contents of the handbook. (c) The department shall make the handbook available on the Internet. (d) The department shall distribute printed copies of the handbook to persons who request a copy and may charge a fee as provided in s. 20.908 for the costs of printing and distribution. (24) The department shall provide information to employers concerning the financing of the unemployment insurance system, including the computation of reserve percentages and their effect upon the contribution and solvency rates of employers, and shall post this information on the Internet. If the department provided a statement of account to any employer, the department shall include the same information on the statement. In addition, the department shall provide the same information in writing to each employer who becomes newly subject to a requirement to pay contributions or reimbursements under this chapter. (a) In this section, “appeal tribunal” includes appeal tribunals under s. 108.09 (3) (a) 1., 2., and 3. (b) The department shall conduct an initial training for all individuals who serve as appeal tribunals to prepare them to be able to perform the duties of appeal tribunals established under this chapter. (c) The department shall require each individual who serves as an appeal tribunal to satisfy continuing education requirements, as prescribed by the department. (26) The department shall prescribe by rule a standard affidavit form that may be used by parties to appeals under ss. 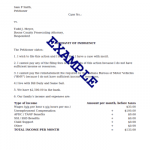 108.09 and 108.10 and shall make the form available to employers and claimants. The form shall be sufficient to qualify as admissible evidence in a hearing under this chapter if the authentication is sufficient and the information set forth by the affiant is admissible, but its use by a party does not eliminate the right of an opposing party to cross examine the affiant concerning the facts asserted in the affidavit.